Trained and skilled licensed nurses from Healthy Schools will be administering the vaccine by injection only. There is no cost for the student to receive a flu shot. Parents and guardians must provide consent and MUST be present for a student to receive the flu vaccine. Sign your child up online by Thursday, Oct. 18. Choose “Yes” if your campuses flu shot clinic was canceled and you previously completed the online consent form. Choose “No” if you have not completed an online consent for your child to receive a flu shot. School name field, select Saturday. If you are unable to complete the consent form online, you can download and print a Spanish or English consent form and bring the form with you to the scheduled clinic at C.D. Fulkes. Do not return the forms to your child’s campus or give the forms to your child; parents must be present for the student to receive a vaccination. 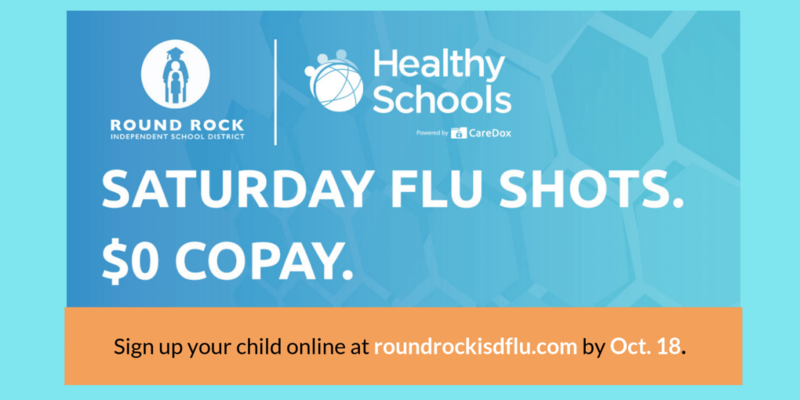 This clinic is brought to you by Round Rock ISD and Healthy Schools. Healthy Schools apologizes for any inconvenience caused by the cancellations of the previously scheduled clinics.